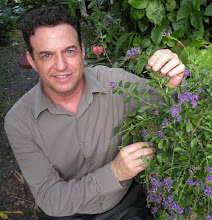 Several years ago at our Broward County Herb society meeting, we had a guest speaker who was a soap maker. We learned that our largest organ of our body was our skin. According to the speakers, what we wash ourselves with can have health benefits or health hazards. Latest research confirms there are several toxic ingredients in our soaps and shampoos, according to Dr. Marcola. Some people are more allergic to the ingredients than others. He recommends avoiding all of them and buying organic products. Last week I discovered a twitter peep who was a soap maker. Her name is Jenny Anthony. I tweeted t o her that I loved natural soaps. She was kind enough to offer to send me a bar to try. A package arrived and I was delighted to find three beautifully wrapped soaps that perfumed the room with a potpourri of fragrances. One was called Summer‘s Night. The ingredients are olive oil, coconut oil, palm oil, turmeric powder and fragrance. I have to find out what the fragrance is; it is so aromatic and pleasant. A Calendula petals soap has shea butter, coconut oil, olive oil, sweet almond oil, and silk. The Biltmore Estate in Asheville, North Carolina has been on my bucket list for quite some time. When friends extended an invitation to visit them in the mountains of North Carolina, I had no idea they were close to Asheville and had no intention of visiting the Biltmore during my mini vacation. When I casually mentioned some day I would love to visit there, they said it was only a forty five minute drive away and we could easily fit it into our schedule. We bought tickets online and went the next day. The water garden was spectacular, with many pools of water lilies, cannas, papyrus and more. The Biltmore was everything I had seen on the internet, TV, magazines and much more. Being passionate about gardening, history, art, architecture and old homes I was overwhelmed at the super size of everything. We spent a half a day visiting and could have stayed at least two days to see it all. There are great opportunities to photograph butterflies and other insects at the informal English countryside garden area. The botanical garden has some wonderful mature specimens dating back over one hundred years when Fredrick Law Olmsted designed the garden. There are vast vistas that Olmsted is famous for. Each garden is a delight, and there are many to see, including a rose garden, greenhouses, flower gardens, and more. There is a winery, farm and more to visit. Enjoy this brief video! Although I do live in a paradise, sometimes it is nice to get way. When I like to go on a vacation, I like it to be very different than where I live. An old friend suggested I visit their cabin in the cool North Carolina mountains last month. Magic to my ears! We would go hiking through the mountains, walk on rocks to cross gurgling streams, and view waterfalls. The forest floor was teaming with life. Mosses, mushrooms, wild flowers, small ferns and tiny plants carpeted the ground. There were wildflowers everywhere. I saw native rhododendrons. There were wonderful ferns and lichens. The trees were tall and thin in the forests reaching up to the sun. I loved seeing all the maples and oaks. The soothing peaceful sounds of the forest was very therapeutic. It was so nice walking through the woods and hearing the water in the streams. Birds were plentiful, and their sweet chirps added to the forest melody. Going away for a few days sometimes is not enough of a vacation. This particular trip was very soothing and relaxing. It was the antithesis of everything South Florida, which was a welcome change. Thank you for stopping by my blog and see you soon.